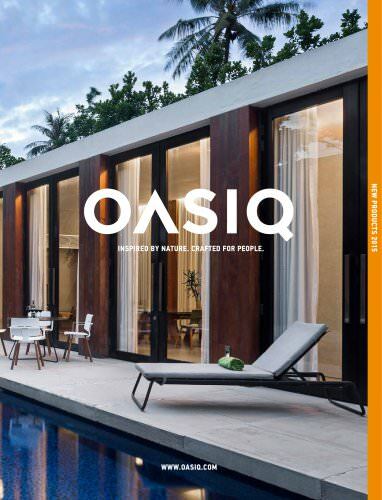 OASIQ EUROPE • T +32 3 4702476 • INFO.EUROPE@OASIQ.COM OASIQ NEW YORK • T +1 212 355 0625 • INFO@OASIQ.COM OASIQ BEJING • T +86 10 87220882 • INFO@OASIQ.COM.CN INSPIRED BY NATURE. CRAFTED FOR PEOPLE. MARO Ready to take the art of relaxation to the next level? MARO’s excellently proportioned teak frame supports king-sized cushions for an opulent lounging experience. Fitted cushions pamper you with their superior comfort. The simple lines of the handwoven rope add a playful twist to the sturdy teak frame. MARO’s modular elements offer the versatility expected of modern outdoor furniture. The sofa and oversized club chairs turn a terrace into an inviting outdoor retreat. Various chaise longue and corner seat combos introduce a clubby vibe to set the scene for entertaining. ROBUST TEAK WITH A PLAYFUL HANDWOVEN ROPE TWIST. 3 SEATER SOFA, CORNER SOFA AND LAZY LOUNGE CHAIR FOR COSY RELAXATION. GIJS PAPAVOINE DESIGNER OF MARO DESIGN VIRTUOSO GIJS PAPAVOINE EXCELS AT TAKING A SIMPLE IDEA TO ITS LOGICAL CONCLUSION. STRONG GRAPHIC ELEMENTS COMPLEMENTED BY AN INSPIRED USE OF BASIC SHAPES CHARACTERIZE HIS WORK. HIS QUEST FOR THE PERFECT MIX OF PURE LINES AND FUNCTIONALITY HAS MADE HIM A PEERLESS DESIGNER OF CHAIRS IN PARTICULAR. THIS CULMINATED IN GROUNDBREAKING DESIGNS IN WHICH GRACEFULLY ARCHED BACKS RAISED THE BAR IN TERMS OF SEATING COMFORT. COCO Meet the new kid on the block. A chair with the winning personality of a style icon. COCO’s allure is unmistakable from afar, and irresistible up close. Designed to stand out in a crowd, this chair brings a sophisticated sense of leisure to that outdoor space where having a good time is always on the menu. COCO’s funky flair is defined by its original blend of materials. Steel frame and aluminium seat panels are powder coated in the same colour to form a striking ensemble. Elegant teak legs heighten the contrast. COCO WITH THE NEW MACHAR TEAK TOP DINING TABLE. SETTING THE NEW STANDARD FOR OUTDOOR DINING. BRING FLAIR TO EVERY TABLE. COCO WITH THE SERAC DINING TABLE. COCO WITH THE REEF DINING TABLE. MARK GABBERTAS DESIGNER OF COCO AND SERAC MARK GABBERTAS IS A MULTIPLE AWARD-WINNING DESIGNER WHO HAS PIONEERED MANY NEW FORMS AND PROCESSES IN FURNITURE DESIGN. HE WAS AT THE FOREFRONT OF THE RENAISSANCE IN THE BRITISH DESIGNER/MAKER MOVEMENT IN THE 1990S BEFORE ESTABLISHING THE GABBERTAS STUDIO IN 2001. THE DESIGN STUDIO CURRENTLY LEADS THE WAY IN EXPERIMENTING WITH NEW TECHNOLOGIES AND HAS EARNED ACCOLADES FOR PUSHING THE BOUNDARIES OF OUTDOOR FURNITURE DESIGN. SERAC & CERU The SERAC and CERU tables test the limits of less spacious areas. Their adaptability opens up new possibilities for turning a small terrace into an inviting meeting place. Or for creating a romantic rooftop dining area with space to spare. SERAC TABELS SERAC’S BRANCHED FRAME IS A PERFECT HARMONY OF ELEGANCE AND STABILITY. A wide variety of sizes with a choice of stainless steel or HPL top make this table the ideal choice when space is at a premium and style is essential. CERU TABELS This trendy table for dining or bar areas is a handsome option in powder-coated aluminium frame and top. Also stunning with an HPL or teak top. A SEAMLESS FIT WITH SMOOTH POWDER-COATED FINISH.